We believe in relationships, values, and the importance of people. For this reason we want you to know who we are and with whom you collaborate. 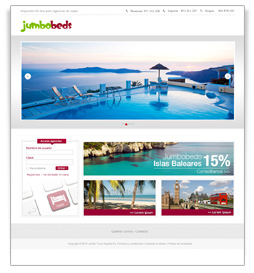 To explain exactly who we are in jumbobeds.com firstly we should position our company within the tourist group to which we belong. Although we are a new scheme,our group is one of the pioneers and largest companies in Europe. We are part of Alpitour World, which is within the TOP 10 of the European tourist groups in both passenger volume and invoicing. We have over 60 years experience in the sector and we are leaders in various segments in which we operate. Not only be an online reservation system, where we offer hotels, transfers and groups, but also a powerful marketing tool, performing specific campaigns on line with market demand for each segment, either Weekend, special Families, Bank Holidays and Holidays,etc., along with a variety of innovative products that you can discover on our website. We work to be part of your day to day, and help you win over and Gain the trustworthiness of your clients, through the use of an easy and fast system.